I learned a lot this past weekend: Traveling in a wheelchair is much harder than it looks! I'm glad I flew out to Washington, D.C., because seeing my niece's Bat Mitzvah was pure joy. So what did I learn? First and foremost, just because a place meets the requirements of the law, doesn't mean it is easy to get around in a wheelchair. Case in point: the Metro. I love the Metro; who doesn't? Technically, it is handicapped accessible. However, you could spend much of your life looking for the necessary elevators. Second lesson: When you are in a wheelchair, people simply don't see you. I don't know if it's because you are lower in space than they are or that wheelchairs make people uncomfortable. At any rate, I am determined to be more considerate to people in wheelchairs. As a special ed teacher, I certainly have read about what life is like for people in wheelchairs. It sure is different, though, to live it. On the upside, my family was wonderful in pushing me around and making it possible for me to be there at all. My brothers, my daughter, my son, my cousins. They were all incredibly patient and considerate. I am very lucky! And the sock in the photo? 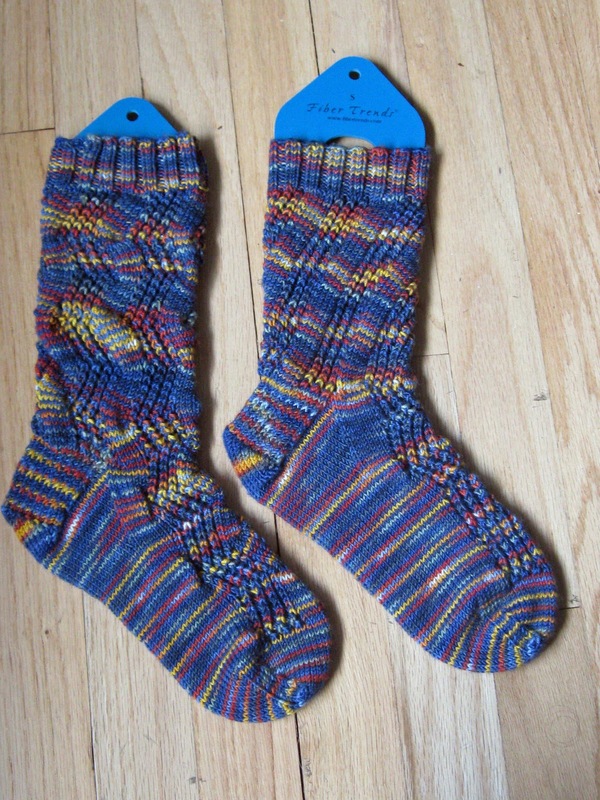 It was my traveling project: Froot Loop, a top-down sock available for free from Knitty. I highly recommend this pattern. It's easy to memorize, but clever enough not to be boring. The yarn is something unlabeled from my stash. I'm pretty sure it is Dream in Color Baby. It's supposed to be a lace-weight, but is working well for the socks. If they come out small, I'll gift them to a smaller person! Just popping in to say 'hi' and that I'm still here. It's been a busy week at work and I'll be flying -- broken leg and all -- to the East Coast for my niece's Bat Mitzvah this weekend. The pinks actually look better in real life. This is definitely more attractive that pulling on a sock and rolling it back. There is a problem: It doesn't stay on very well, so I'm going to have to figure out a way to fix that. The photo above is not the greatest photo because I took it with my new iPhone. I never had any interest in paying for a smart phone until I broke my leg. Having this little gadget that allows me to check my email and look things up on the Web and maintain a calendar without calling out "Keith, can you get my (fill in the blank)?" has been a sanity-saver. Also the sound quality on phone calls is much better, which is important to because I do have a hearing loss. I have to say that I am in love with my phone! As someone said to me yesterday: "Welcome to 2013." I'm glad to be here; too bad it took a broken leg to get this far!" I had my first cast removed Monday, and the news was good. The x-ray showed that the surgeon did an amazing job. The bone is healing in perfect alignment! The four screws and metal plate make me look a little bionic. They may cause me trouble at airport security, but I'm grateful for them. 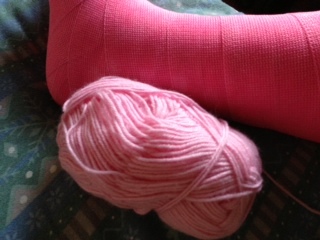 I could not pass up choosing the pink cast. I'm actually more of of a blue girl, but pink just seems right for spring. As for that skein of yarn. I want to knit a matching toe cover (it's still cold here at night). I'm not very good at toe-up so this will be a good learning experience. Since the x-ray looked so good, I went back to work on Tuesday, and I was overwhelmed by the welcome I got from my students. As a special education teacher, I do a lot of behavior management, which includes pushing them to follow rules and do their work. Sometimes I worry that I don't have time for enough positive interactions! But, I guess I do OK. It's good to be getting back out into the world, but it is also very exhausting! Isn't this amazing?! Two -- count'em two -- skeins of sock yarn and an adorable knitted bracelet. If you like the bracelet, check out her blog (link above) to see more. She's one of those people who can just knit stuff -- without a pattern. I don't think I'll ever get that far! Anyway, my heartfelt thanks goes out to Kathy. This broken-leg stuff is hard. I keep reminding myself that at least my situation is temporary -- unlike so many of our soldiers and victims of terrorism. Still, it's the kindness of people like Kathy that gets me through each day. And do check out Kathy's blog. They really do live off the grid in a beautiful part of California! Details: The pattern is Rib Fantastic from Knitting Socks with Handpainted Yarn by Barb Brown The yarn is medium-weight Socks that Rock. I got the yarn from a destash, and I don't think I ever knew what the colorway was. At first I didn't like the heavy feel of the yarn, but as I worked with it, I grew to appreciate it. After all, I do live in Wisconsin and my feet are always cold. Also, the yarn is so smooth and silky. I think they will be great under winter boots -- where no one will see my major mistake! As for the pattern, I'm less enthusiastic. 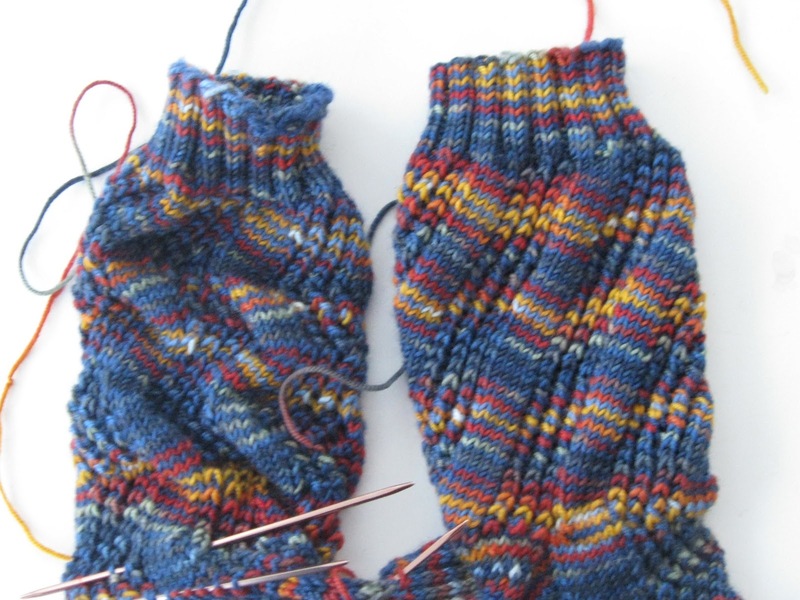 It succeeds in preventing pooling, and I appreciate that, but when knit correctly (sock on the left), it bulges on the calf in an unflattering manner. All said, I'm glad I finished these. I started them in January 2011! I think they will be useful. My heartfelt thanks go out to all my blog readers for their words of support. It took me a couple weeks to understand how serious a broken leg is -- hey, it's my first broken bone! -- and I appreciate all the support. When I pulled this Hecate out, it was about twice as big. I went into the next lace section and found that my stitch count was off so far that even I could not fudge it! I had not put in a single lifeline (dumb, dumb, dumb! ), so I figured it would be just as easy to start over. So here I am. I was hoping to have this for summer traveling, but I did lose a lot of time. Still, I figure it's better to do it right than to finish on time. As the pain from the broken leg and subsequent surgery wears off, I've become aware of how much this is going to impact my life. I won't be walking normally for three months. It's just as well that I don't run anymore because that would take at least 6 months of healing! I realize there's an irony in my reading this book at this time; however, I had started reading before my fall. Anyway, T.C. Boyle is not capable of bad writing. 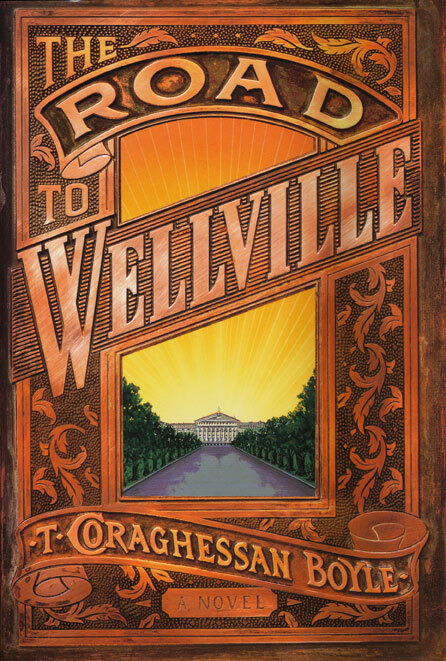 This gracefully written book fictionalizes the story of John Kellogg, founder of the cereal empire. The story is told from a variety of viewpoints, all of which coalesce nicely by the end of the book. In addition to be a very good read, Boyle teases out the universal truths in the human desire for a formula for health. 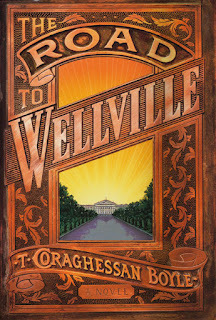 Although the novel is set in the early 20th century, it rings very true today. Did I really get this far on the second sock (on the left) without noticing the pattern was significantly different from the first sock? Apparently I did. The pattern is Rib Fantastic from the book Knitting Socks with Handpainted Yarn by Barb Brown. I started these on January 1, 2011! 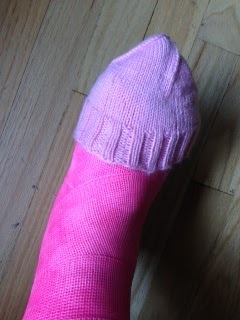 Clearly I have had my struggles -- largely with the yarn, which is Blue Moon Fiber Arts Socks that Rock Medium-Weight. It's my first -- and only -- experience with BMFA, and I was put off by how thick the medium-weight is. 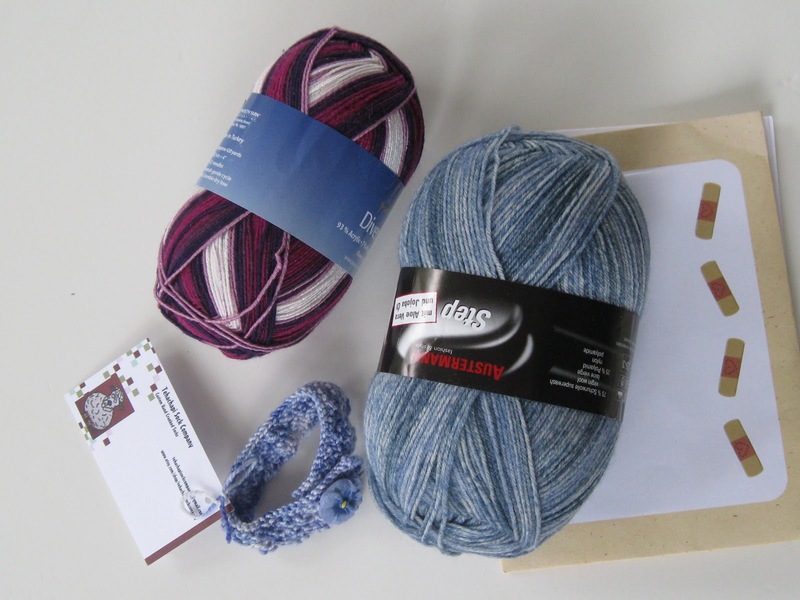 Because I bought them on a Rav destash, I wasn't able to touch it until it arrived. 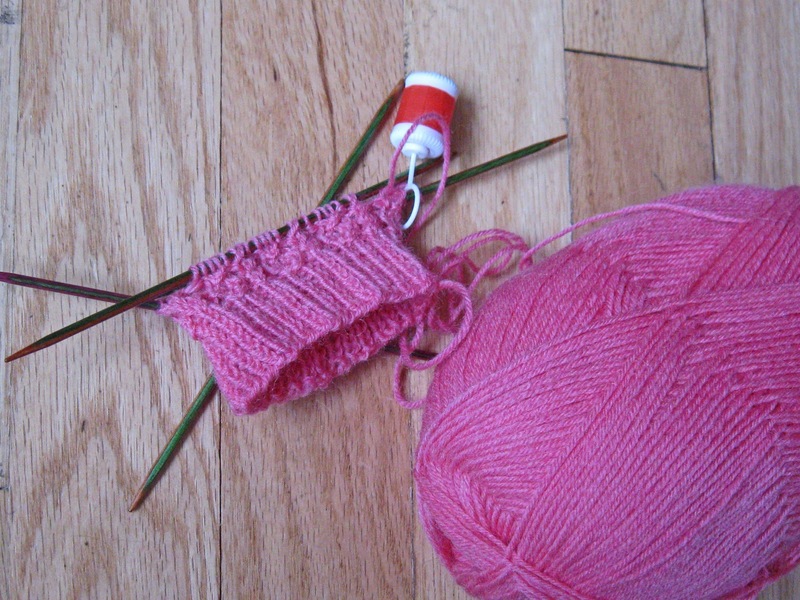 The yarn is amazingly soft and smooth, so I went ahead and began knitting. Got through sock number 1 and then the project went into deep hibernation. I pulled it out earlier this year when I decided to devote some knitting time to UFOs. Since it was the middle of the winter, I realized that thicker socks would be nice and cozy in my boots. I knit along happily on sock number 2 until I pulled out its mate to make sure I was starting the heel flap at the same place. Well, length turned out to be the least of my problems. As you can see, I read the pattern differently for each sock. In disgust, I put the project back into hibernation. However, being laid up these last 10 days, I decided to finish the pair. Really, who cares if the legs don't match? In fact, inside boots or jeans, no one will even see the legs! The pattern is Froot Loop from Knitty. It's been on my Ravelry queue for ages. I was prompted to make it when I saw a finished pair knit by Bells Knits, which turned out beautifully. The yarn comes out of my stash: Lion Brand Sock Ease. I picked this up on clearance; it's regularly about $10, but I nabbed it for $3.99 at Joanne Fabrics. 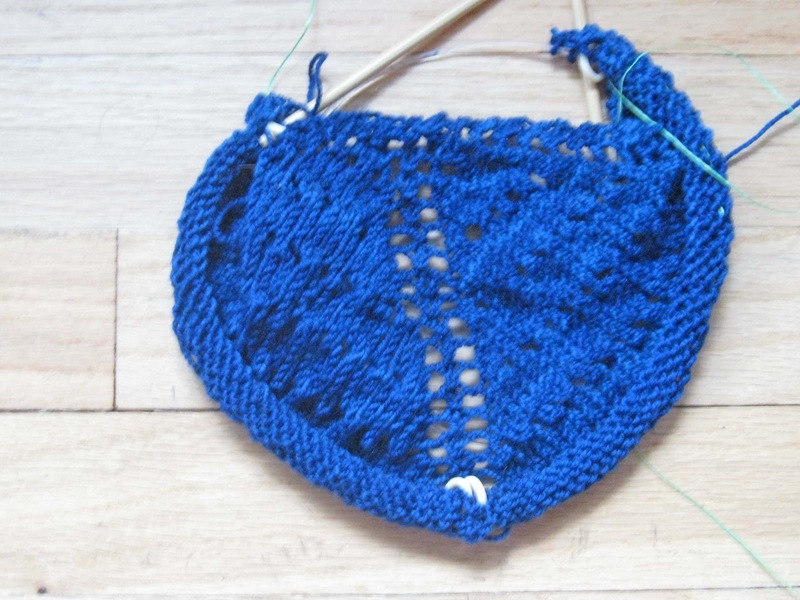 I didn't look it up on Ravelry until I had cast on, and I am dismayed by some of the negative comments. While many knitters said the yarn was nice to work with and wore well, others reported multiple knots and splittyness. The scariest comment claimed that wear the yarn is like walking on fiberglass particles. I decided to go with the positive commenters and hope for the best. Yesterday I stayed in bed all day because moving my leg hurt so much. My friend Marsha was kind enough to come by around noon and get me some lunch. Today, though, I'm out of bed and hanging out in a comfy chair in the sunniest part of my living. The sun alone has really helped me perk up!